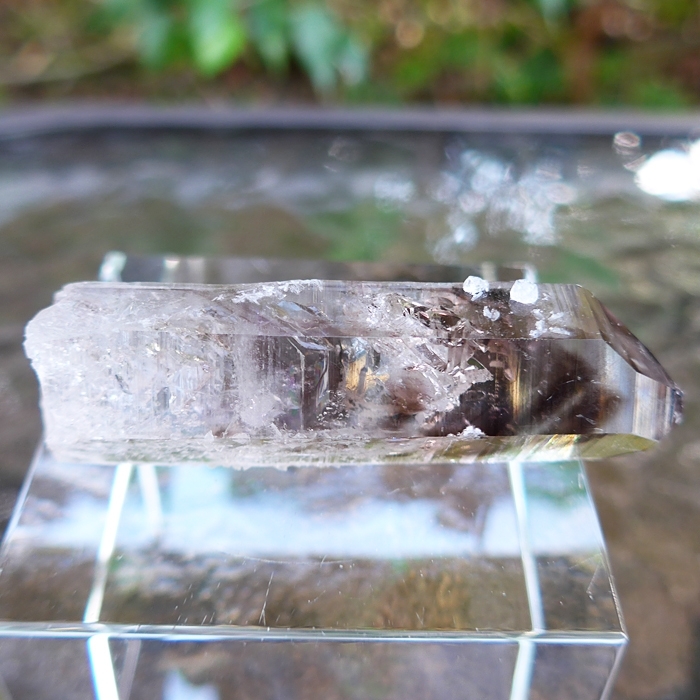 Dimensions (HxWxD): 2.75" x .75" x .5"
This one of a kind, beautiful gemstone quality AAA Brandberg Smoky Amethyst Phantom with Prehnite, weighing 1.15 ounces, or 33 grams, and measuring 2.75 inches in length, is a Lightworker's power tool and a unique mineralogical collector's item. 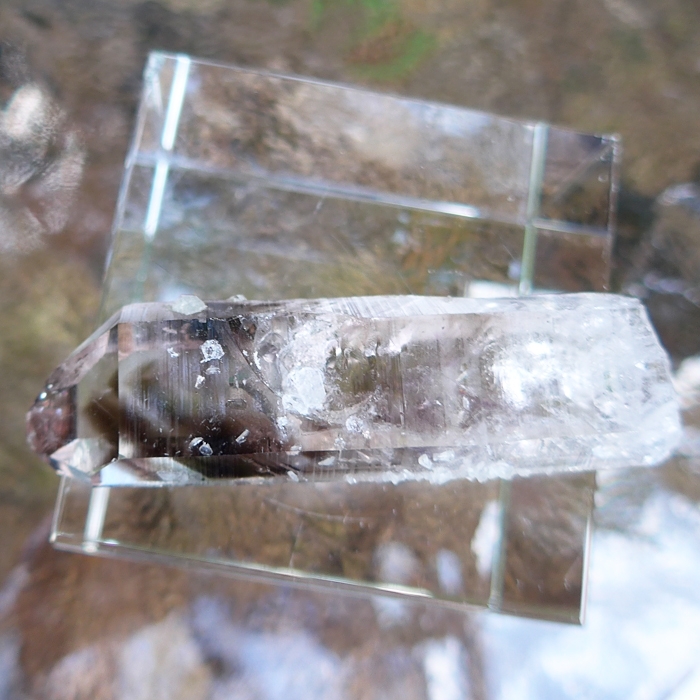 This unique phantom Brandberg smoky amethyst crystal exhibits a pale violet hue, excellent clarity in the termination tip, a nearly flawless tip, and an exquisite natural finish, unpolished and untreated in any way. 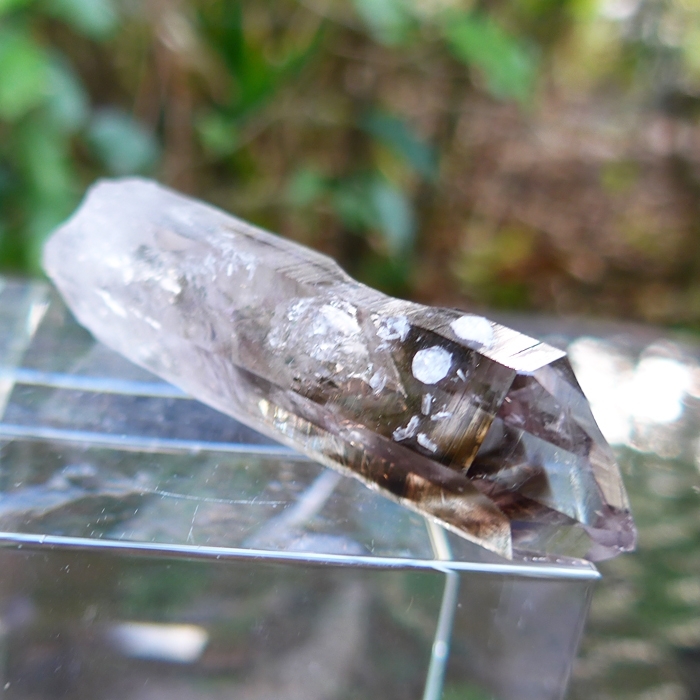 You can easily see the multiple earth-tone smoky phantoms and the violet hue within the shaft and termination tip, which also contains brilliant mica like pointy inclusions, accenting the beautiful phantom formation. 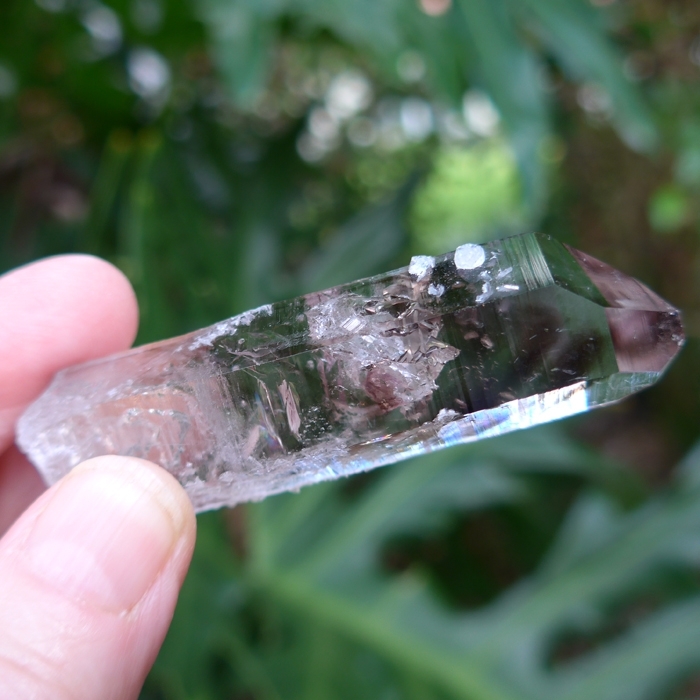 In addition there is a sprinkling of prehnite gemstones studding the shaft! This piece is so lovely, it looks painted by the hand of the Great Mother herself! 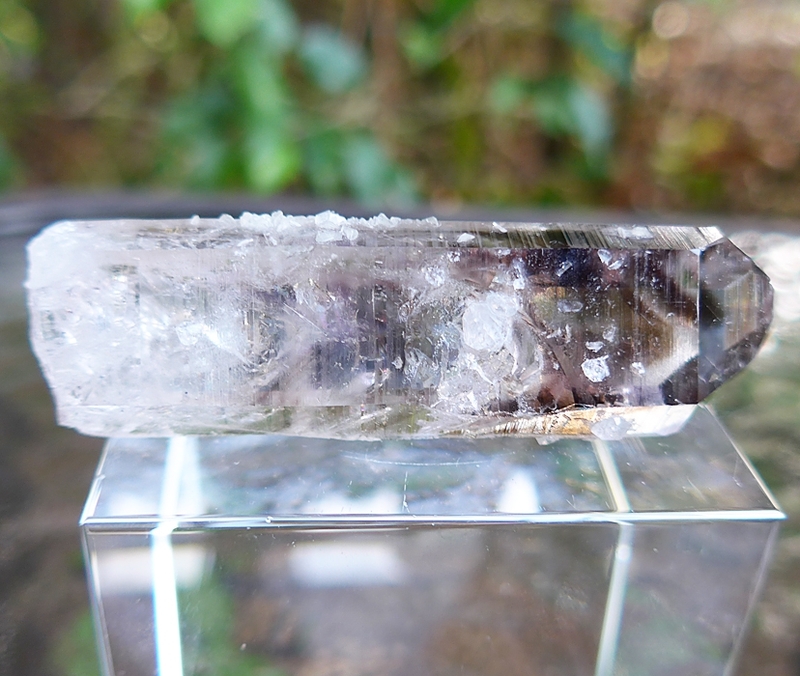 Brandberg Smoky Amethyst helps connect with the Divine Presence within each of us, and with our Spiritual Guides and Teachers and Angels, incarnate and disincarnate, and prehnite is a stone of vision and manifestation, so the combination of these two powerful stones can be of service to meditators, healers, and spiritual seekers on all paths, both Eastern and Western. The African bushmen consider the entire mountainous region sacred, and call the central peak the "fire mountain". Over 43,000 rock paintings can be found on the mountain and in the surrounding area, in around 1000 different sites. 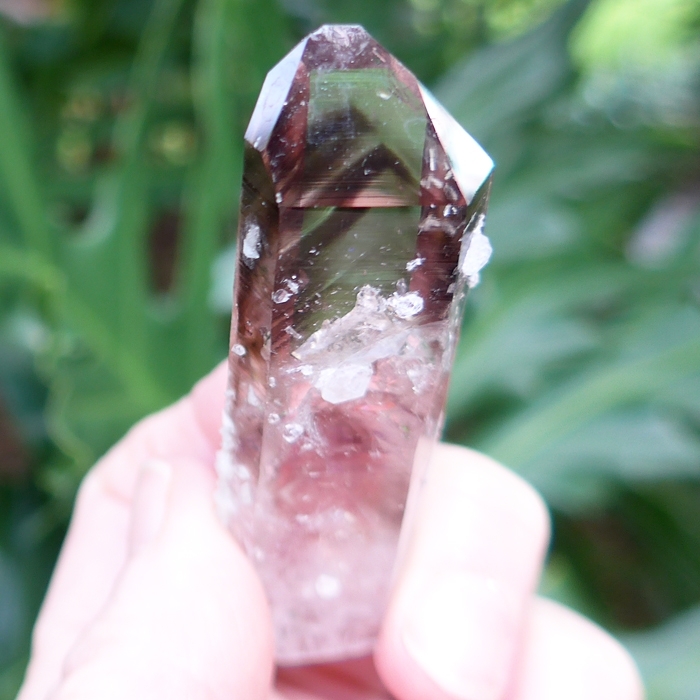 This region was formed over 130 million years by the fossilization of ancient rain forests, and now produces amethysts with exceptional purple color, clarity and a vibrant luster that is umistakable. Note: Weight above is shipping weight. Net weight is 33 grams or 1.15 ounces.